Air Canada just matched WestJet’s seat sale. 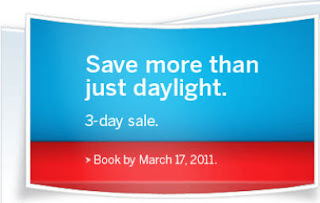 Air Canada currently has a 3-day sale: Canada, USA, Sun destinations. Travel until June 29, 2011. Book by March 17. Spring has arrived along with great savings. When you fly with us, great fares are only the beginning. Add to that personal touch-screen TVs at every seat‡, power outlets within easy reach, Aeroplan Miles and more. Just choose your destination and book by March 17. Click here to check out Air Canada’s flights.